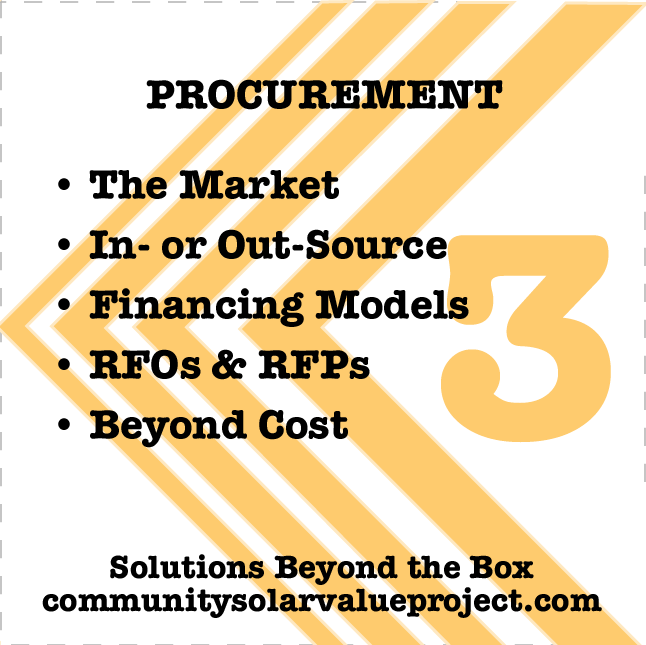 Whether the community solar resource is utility-developed, acquired by power purchase agreement (PPA) or provided as part of a turnkey program package, the procurement process for community solar services and resources is a rich area for improving net value. Here, CSVP provides a community solar market landscape assessment, which serves as an overview of and a guide to early-stage planning decisions. A webinar, including utility guest speakers, illustrates many of the lessons from that publication. In addition, we include CSVP's concise outsourcing decision key, a report in presentation format. We also provide an introduction to project financing models, suitable for investor-owned or consumer-owned utilities. A procurement resource guide offers direct links to publications with tips on developing a solar project RFP. It is accompanied by a library of utility-led RFPs for various solar projects. The CSVP publication, Community Solar Program Development Landscape: A Brief for Utility Program Designers, provides an introduction to the community solar market, procurement choices, and implementation strategies, as they impact utility-led community solar programs. The brief pays particular attention to the early-stage decisions, a comparative review of utility-driven and third-party business models, a summary of drivers that can add net value to a utility program, and tips to create the best balance between specification and flexibility in a solar RFP. The webinar, Smarter Procurements for Community Solar Programs, was live-broadcast in December 2016, to introduce the Market Landscape brief. It features a panel, led by Andrea Romano of Navigant, with three utilities that each took a different approach in their community solar procurements. Speakers Erin Buchanan from Cedar Falls Utilities, Karen Poff from Austin Energy, and Ricardo Luna from CPS Energy (San Antonio) are featured in one of CSVP’s most popular webinars. This short, slide-based report puts decisions about whether to complete program steps in-house or whether to out-source in context with the overall program-design process. The report includes select, updated material. Outsourcing for community solar today could mean engaging a turnkey provider, or it could mean using outside products and services to complete specific tasks for a value-added utility program. This key is designed to help utilities create a balanced, strategic approach. This brief provides a concise introduction to two major development strategies for community solar, out-sourced and utility-driven. Financing choices under each model are discussed, with emphasis on utility options using debt financing or via third-party arrangements (PPA, SSA, leases, etc. and buyout or flip structures). Charts summarize the pros and cons of different options from the utility perspective, which is seldom covered in other business model assessments. The brief also includes many active resource links. A second resource provided here is a factsheet on the value and treatment of Renewable Energy Credits (RECs). Many community solar developers wish to retain the project RECs. Utilities also may wish to retain the RECs, which embody the environmental attributes of the solar generation. However, when the RECs are not transferred directly to the solar customers, it is technically inaccurate to say that these customers are receiving solar power. This factsheet clarifies the issue and outlines best practices. This guide takes the form of an annotated bibliography. It includes with links to portal websites and documents. Most of the guidance is provided for non-utility procurements. However, these resources are easily adapted for utility use. Please note that some of the links to solar-development resources from the U.S. DOE Better Buildings Program have changed since publication of this document. As of fall 2017, they may be found here. With the support of its Utility Forum members, CSVP has collected actual RFPs for utility-driven community-solar procurements. These RFPs represent a range of solar project sizes, siting choices, ownership choices and ultimate program offers. Yet for many utilities who are acquiring community solar resources for the first time, a review of these RFPs can be very instructive. Please refer to the Resource Guide for Local Solar Procurement (above) for best-practices related to running a solar resource procurement process.